STOP THE PRICE INCREASE OF .COM! Hundreds of millions of dollars are at stake as the current price freeze on Dot-com domains is set to expire on November 30, 2018. Verisign, the company with the exclusive rights to issue Dot-com domains, will likely then seek a price increase. Individuals and small businesses will bear the brunt of the price increase which will have the effect of a multi-hundred million dollar “tax” on the Internet economy. The US Government has stepped in before to freeze Dot-com prices. It is time for it to do so again to protect Internet users. Dot-com is by far the most popular domain extension in the world, with nearly 134 million registered Dot-com domains. Dot-com is the domain extension of choice for individual American registrants and small and large businesses, as well as domain name users internationally. An increase in Dot-com pricing, if similar to previous price increases, would total hundreds of millions of dollars over the next few years. A vast sum would thereby be transferred from millions of Americans and people throughout the world, to an already highly profitable, “quasi-monopoly”, Verisign. Versign, the company granted the exclusive “monopoly-like” contract to manage all Dot-com domains by the US Government, is “The Most Profitable Company You’ve Never Heard Of”. Verisign has leveraged their monopoly-like position into a “cash printing machine” generating over $2.0 Billion in profits over the past 5 years. Verisign faces no viable competitive pressures to rein in costs. Verisign’s top four executives earned about $18 million in total compensation in 2017 – equivalent to 7% of Verisign’s total operating expenses (including R&D and G&A and not including cost of revenue). In comparison, Oracle and Adobe paid their four top executives the equivalent of a mere 1% of operating expenses. The US Government helped create this problem by granting an exclusive, no-bid contract to run the .com registry, thereby creating a “quasi-monopoly” over what is essentially, a public resource. In the previous administration, the head of the National Telecommunications and Information Administration (NTIA), a part of the US Department of Commerce, prevented Verisign from raising prices on the American public. Will David Redl, the current head of NTIA, now allow Verisign to increase its windfall profits at the expense of the American consumer and small businesses? Sign the petition now to ask NTIA to stop Verisign from using their “monopoly-like” power to take even more money from hard working small businesses and individuals! There are approximately 133.9 million .com domain names registered. Verisign, a public company with a market capitalization of over $18 billion and net income in 2017 of US $457 million on revenue of $1.14 billion, enjoys exclusivity as the sole registry operator for all .com and all .net domain names pursuant to a contract with Internet Corporation for Assigned Names and Numbers (“ICANN”). That’s an operating margin of over 60%! You, the consumer and small businesses pay Verisign indirectly every time you register a .com or .net domain name. 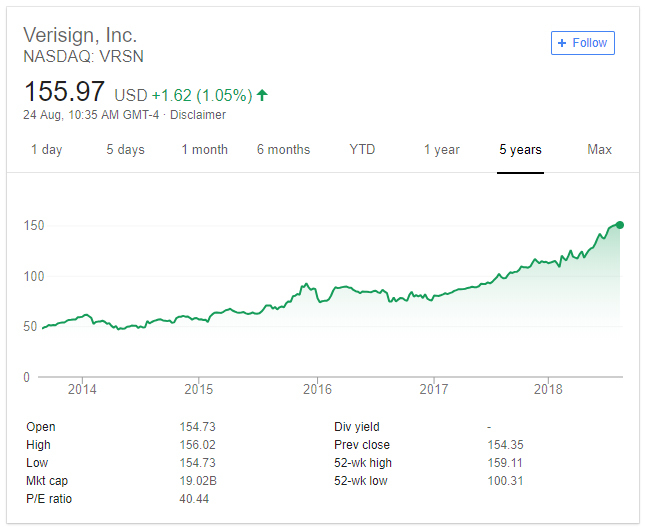 And Verisign’s stock has taken off as a result, increasing from $49.50 in 2013 to $151 in 2018. 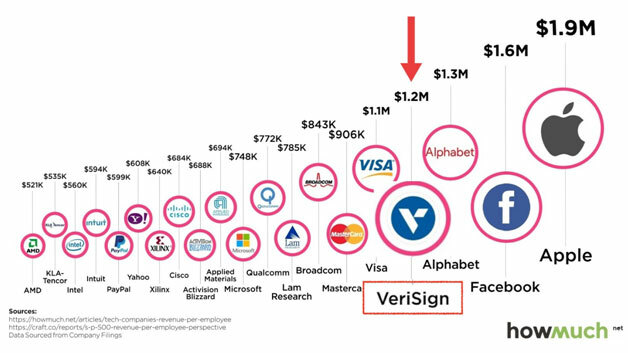 Verisign even places fourth behind only Apple, Facebook, and Alphabet (parent company of Google) in revenue per employee, and stands ahead of Visa, Microsoft, Intel, and Paypal, amongst many others. What are people saying about Verisign’s Exclusive Contract to Operate .COM? How would a Price Decrease or a Price Increase Affect You? JOIN THE CAMPAIGN TO STOP THE PRICE INCREASE OF .COM DOMAINS! Take action now and stop any .COM price increase!